Plastic cups from the dollar store were purchased to make seedling containers. Cup size is 266 ml or 9 fluid ounces with a height of 3.75 inches. Holes were burned around the periphery at the bottom for drain holes, using a heated soldering iron.A coffee filter is placed in each cup to prevent soil from working out of the drain holes,and to contain the plant roots when transplanting. The soil being dry, the cups was placed in a large container for bottom watering, also a syringe of water was placed on the top of the soil. All future watering will be from the bottom. This tends to inhibit mold forming and damping off. A cloth is placed over the cups to maintain heat and moisture (humidity) to some degree. The containers were placed on a heating pad, temperature monitored with a dial thermometer.The plants as they grow will be moved to larger pots as determined necessary. 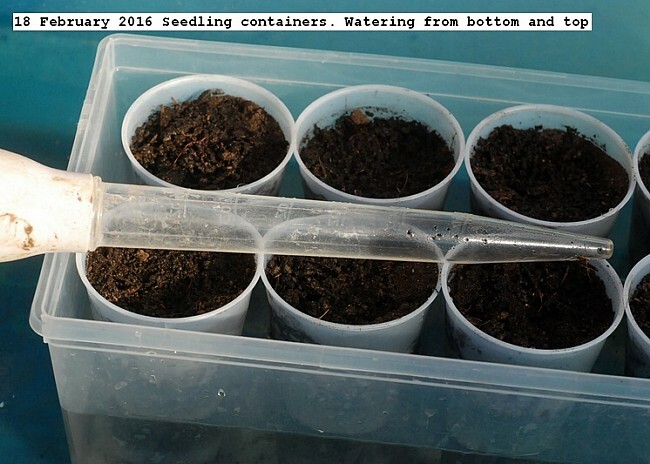 This entry was posted in Uncategorized and tagged Seedling containers. Bookmark the permalink.